The latest and most spectacular evolution of a sport naked dynasty. Born in 2002 out of Aprilia's intuition to strip down and fit a handlebar on their flagship superbike (which at the time was the V-twin RSV mille), thereby combining all the advantages of a chassis par excellence with the fun of sitting up and dynamic riding. Simply incomparable, now more than ever. 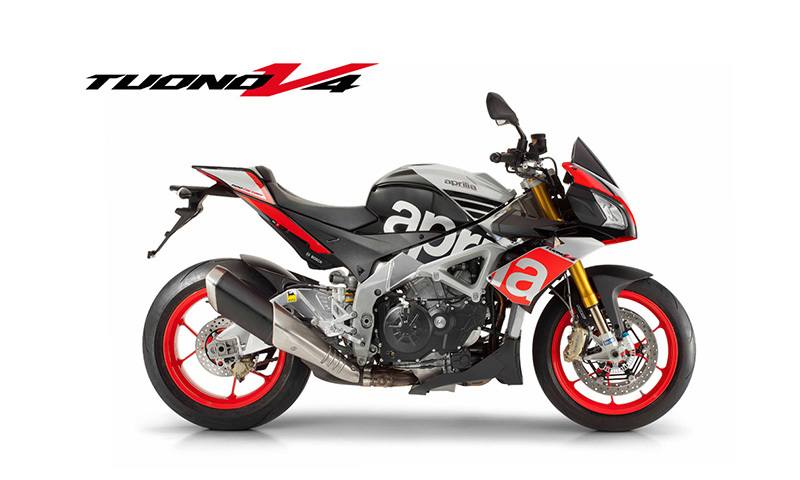 There is no other naked bike as sporty and effective as the Tuono V4 1100. Upside-down ��one by one�� Sachs fork, � 43 mm stanchions �hlins fork with TIN surface treatment. Double braced aluminium swingarm; mixed low thickness and sheet castig technology. 220 mm diameter disc; Brembo floatig calliper with two 32-mm � isolated pistons.